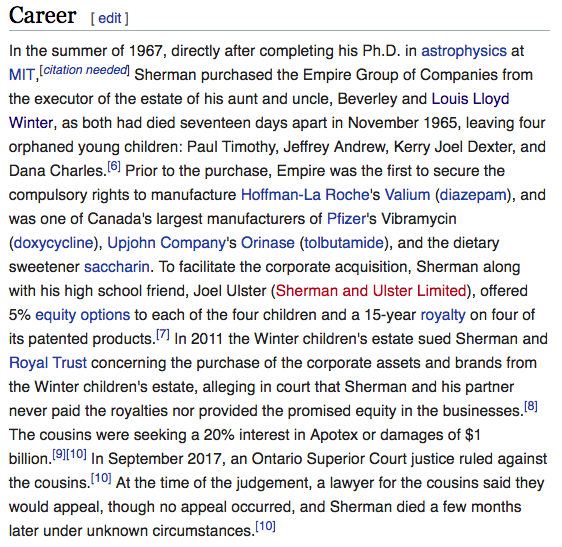 Leave it to Wikipedia to leave just a few bread crumbs that help figure out the motivation behind the murder of Canadian pharmaceutical magnate Barry Sherman and his wife Honey. 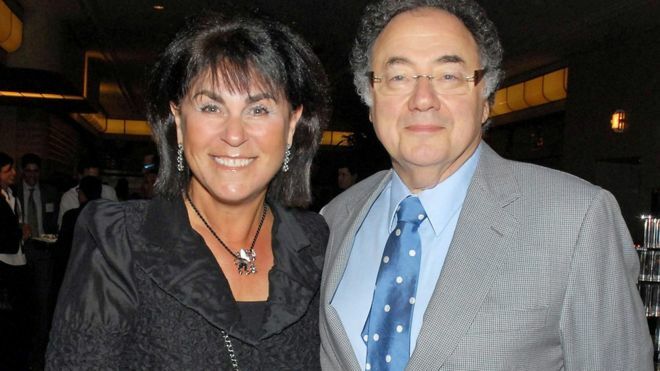 A close reading of billionaire Barry Sherman’s Wikipedia page as follows appears to lay bare what may have been the real motive behind the double homicide in Toronto. The well-documented back story has all the elements of an Agatha Christie novel. Given just this first paragraph under Sherman’s “Career” highlights shown above, questions must be asked about his uncle’s death at 41, which occurred just 17 days prior to his wife’s death in November of 1965. If there is a smoking gun in this case, it’s likely to revolve around the very curious development that occurred just before Sherman’s purchase of his uncle’s company from the estate. Particularly in light of the unparalleled success that “Valium” experienced throughout the global pharmaceutical marketplace back in the 1960s, is the timing very suspicious. There are LOTs of hot leads here that any armchair PI ought to track down if they are to correctly identify the co-conspirators in what appears to be a multi-decade scam and multiple murder plot. In view of the current murder scheme, it appears that Toronto is now rivaling Los Angeles for high-profile drama, what with Prince Harry’s future wife living there, too. 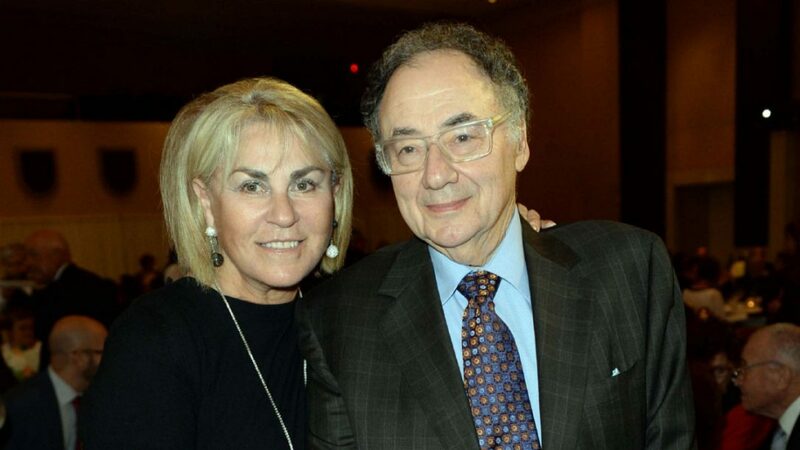 Back to the Barry Sherman murder mystery: it’s only one day after the crime and the official coverup has begun in earnest. The Coverup Begins: Canadian Authorities Expect Us To Believe That Billionaire Couple Did Themselves In Like This? 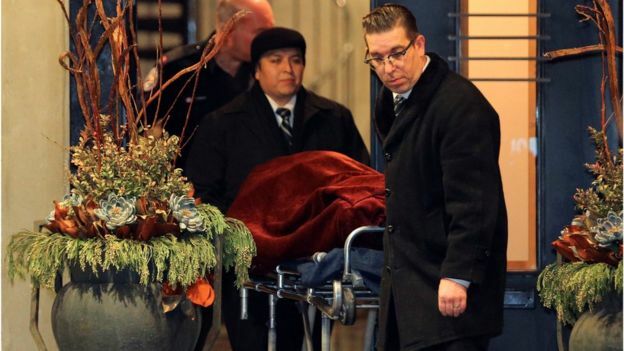 A Canadian billionaire and his wife have been found dead at their home in Toronto in circumstances that police described as “suspicious”. The bodies of Barry Sherman and his wife Honey were found in the basement by an estate agent, reports said. Mr Sherman was the founder and chairman of pharmaceutical giant Apotex, which sells generic medicines around the world. He was one of Canada’s richest men and a prominent philanthropist. There was no sign of forced entry to the property, police said in a statement Friday evening. Local media reported that investigators were not searching for a suspect at this time. Detective Brandon Price told Canadian broadcaster CBC that investigators were still trying to determine if there was foul play involved. Police gave few details and did not confirm the identities of the deceased. However, they were named locally by friends and by officials who reacted with shock at the news. “I am beyond words right now,” Ontario’s Health Minister Eric Hoskins said on Twitter. Senator Linda Frum presented the couple with a Canadian 150th anniversary medal in late November, awarded to Canadians for “generosity, dedication, volunteerism and hard work”. “Today I am gutted by the loss of Honey and Barry Sherman. Our community is steeped in grief. I am heartbroken,” she said. Prime Minister Justin Trudeau tweeted his condolences to the couple’s family and friends. A police spokesman said emergency services were called to the house just before noon on Friday. 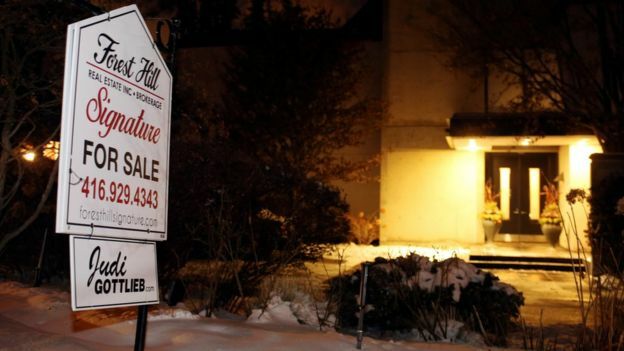 The couple had recently put their luxury home up for sale and their bodies were found by an estate agent who was at the property to prepare it for an open-house viewing, the Toronto Globe and Mail reported, citing a family member. Mr Sherman founded Apotex Inc in 1974 and the firm says it is now the seventh biggest generic drug maker in the world. Forbes magazine puts Mr Sherman’s personal net worth at $3.2bn (£2.4bn).